Introduced populations of non-native species are often associated with low genetic diversity, as measured by neutral genetic loci, and, thus, considered a paradox (but see Roman and Darling 2007). 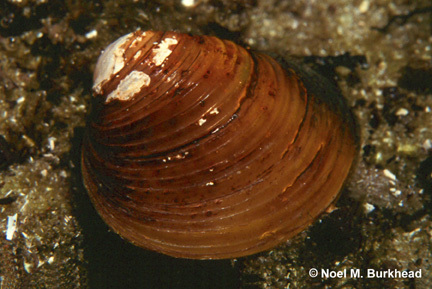 The study by Lise-Marie Pigneur and colleagues documents an extreme example of this putatively paradoxical phenomenon in the invasive clam genus Corbicula. The authors document four, undiversified genetic lineages in Europe and the Americas, whereas the native range, in the northwest Pacific, is characterized by higher levels of genetic diversity. Yet, the relationship between genetic diversity and invasion success is not as straight-forward as it might seem. The mixed mating system exhibited in the native range of these Corbicula clams may hold an enticing clue as to the success of the invasive lineages. The dioecious sexual lineages are strictly diploid, whereas the hermaphroditic asexual, or more specifically androgenetic (i.e., male parthenogenesis), lineages can be diploid, triploid or tetraploid. But, interestingly, the unreduced spermatozoon from one androgenetic lineage can fertilize an egg of another androgenetic lineage. The resultant progeny exhibit the nuclear genome from one and the mitochondrial genome from another lineage, a phenomenon termed egg parasitism or mitochondrial capture (e.g., Hedtke et al. 2008, Pigneur et al. 2012). Thus, despite reduced genetic diversity, androgenesis in Corbicula clams may combine clonality with the ability of rare genetic material exchange. The role of life history traits coupled with labile reproductive systems in invasion success and invasive histories warrants further attention, especially in aquatic and marine environments. This entry was posted in natural history, population genetics. Bookmark the permalink.